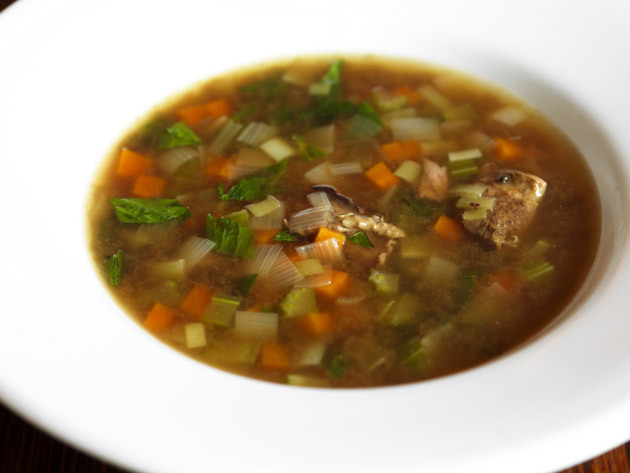 It’s such a shame to scrape grouse bones into the bin when there is still so much flavour left – a couple of grouse carcasses will make plenty of soup for four people. Heat the vegetable oil in a heavy-based saucepan and fry the grouse carcasses, onion, carrot, garlic and herbs on a medium heat for 3-4 minutes, stirring every so often until lightly coloured. Add the tomato purée and chicken stock, bring to the boil, season and simmer gently for an hour. Strain the soup through a fine-meshed sieve into a clean saucepan, reserving the bits of carcass. Add the celery, leek and carrot and simmer for about 15 minutes or until they are tender, then add the cabbage and simmer for another 5-6 minutes. Meanwhile, remove as many bits of meat from the grouse carcass as possible and add to the soup and simmer for a few minutes, re-season if necessary and serve. This entry was posted on December 12, 2010 at 2:20 am and is filed under Food with tags black pepper, bones, broth, butter, cabbage, carcass, carrot, celery, chicken stock, flour, garlic, grouse, juniper berries, knob, leek, onion, salt, soup, thyme, tomato purée, vegetable oil. You can follow any responses to this entry through the RSS 2.0 feed. You can leave a response, or trackback from your own site.